John Bruff Waterview Cottage - on Harbor and on Park - In Town St. Michaels! Property 4: John Bruff Waterview Cottage - on Harbor and on Park - In Town St. Michaels! Stay in the HEART of Saint Michaels! Property 8: Stay in the HEART of Saint Michaels! St. Michael's premier in town summer vacation cottage! 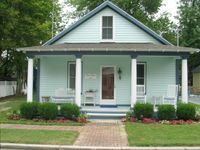 Property 10: St. Michael's premier in town summer vacation cottage! Fully remodel 2 bedroom country cottage with views of Dogwood harbor. Property 13: Fully remodel 2 bedroom country cottage with views of Dogwood harbor. Thistle Dew | "This Will Do"
Property 24: Thistle Dew | "This Will Do"
Pines at Irish Creek | Cabin Nestled Among the Pine Trees and Irish Creek. Property 28: Pines at Irish Creek | Cabin Nestled Among the Pine Trees and Irish Creek. Great location close to town. Well decorated and great location. Beds were comfortable and the bikes were great to have to get around town.